An anti-abortion group says Rep. Bart Stupak is no longer deserving of an award it planned to give him. (CNN) -- Inside the Washington beltway, Rep. Bart Stupak is taking heat from the left and right. Three days after a major anti-abortion group took back its "Defender of Life" award from the Michigan Democrat over his support for the health care bill, the nation's leading abortion rights groups announced Wednesday that it is backing Stupak's primary election challenger because Stupak helped delay the legislation for months. Abortion rights groups blame Stupak for holding up the health care bill, which President Obama signed Tuesday, over objections to its abortion provisions. 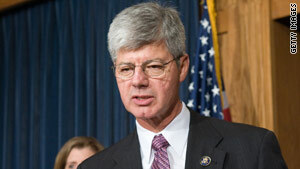 Abortion foes said Stupak betrayed them by ultimately signing on to the bill. But for all the criticism Stupak is getting from both sides of the abortion divide, neither his Democratic nor Republican challengers stand much chance of unseating him in Michigan, political experts said. "He has an impeccable reputation with most Democrats in his district and is considered an institution in Michigan's Upper Peninsula," which encompasses much of Michigan's 1st district, said David Wasserman, House editor of the Cook Political Report. The attacks from Washington, Wasserman said, "play into Stupak's argument that the guns aimed at defeating him are from outside the district." NARAL Pro-Choice America and the Planned Parenthood Action Fund said Wednesday that they're endorsing Democratic candidate Connie Saltonstall against Stupak in Michigan's August primary. "For years, [Stupak] has attacked women's freedom and privacy and, for the last several months, seized the national spotlight as he held health care reform hostage to his anti-choice political views," said Nancy Keenan, president of NARAL Pro-Choice America. "The clock is ticking on Mr. Stupak's 15 minutes of fame." For the last six months, Stupak was a hero to anti-abortion groups for leading a group of conservative House Democrats to oppose health care reform unless it prohibited health care plans that received federal funds from covering abortion. But Stupak struck a deal with the White House to support the legislation on Sunday. "By accepting this deal from the most pro-abortion president in American history, Stupak has not only failed to stand strong for unborn children, but also for his constituents and pro-life voters across the country," said Marjorie Dannenfelser, president of the anti-abortion group the Susan B. Anthony List Candidate Fund. "...[A]ny representative, including Rep. Stupak, who votes for this health care bill can no longer call themselves 'pro-life.' "
The fund had planned to present Stupak with its "Defender of Life" award on Wednesday night at its annual Campaign for Life gala. The group announced Sunday that it was rescinding the award. Saltonstall, a mediator and board president of Hospice of Northwest Michigan, may be Stupak's toughest primary opponent since he was elected in 1992, said David Haynes, a political science professor at Northern Michigan University. Still, he said, Saltonstall faces long odds. "Since Roe v. Wade, there has not been a pro-choice congressman elected in this district," Haynes said. "This district is pro-life, pro-gun and pro-working families," he said. "Democrats know that they would be at great risk if Bart wasn't on the ticket because then Republicans would have a good shot here." Stupak declined to comment on Wednesday. He faces light general election opposition, though others may still enter the race. One declared Republican candidate, Linda Goldthorpe, lost her primary in 2008. The other, Dan Benishek, is a surgeon and first-time candidate. According to the Cook Political Report, Stupak is considered to be safe heading into this November's election. "The Republicans really just want to keep Stupak at home defending his seat so he can't help other Democrats in the state," said Haynes. "He's been a huge influence in state politics." President Obama signed an executive order reaffirming the existing federal ban on abortion funding on Wednesday, but abortion rights supporters and opponents dismissed the move as a symbolic gesture. Stupak attended the signing, which was closed to the news media.